What links the retreat of Jakobshavn Isbrae, Wilkins Ice Shelf and the Petermann Glacier? Changes occurring in marine terminating outlet glaciers of the Greenland Ice Sheet and ice shelves fringing the Antarctic Peninsula have altered our sense of the possible rate of response of large ice sheet-ice shelf systems. There is a shared mechanism at work that has emerged from the detailed observations of a number of researchers, that is the key to the onset and progression of the ice retreat. This mechanism is shared despite the vastly different nature of the environments of Jakobshavns Isbrae, Wilkins Ice Shelf and the Petermann Glacier. We reviewed in a previous post the first mechanism for explaining the change in velocity of Greenland’s large outlet glacier – the Zwally effect – and why it is not the key. This mechanism relies on meltwater reaching the glacier base via moulins and reducing the friction at the base of the glacier. This idea was observed to be the cause of a brief seasonal acceleration of 10- 20 % on the Jakobshavns Glacier in 1998 and 1999 at Swiss Camp 35 km inland from the calving front (Zwally et al., 2002). Examination of recent rapid supraglacial (i.e. on the surface) lake drainage documented short term velocity changes due to such events around 10%, but little significance to the annual flow of the large glaciers outlet glaciers (Das et.al, 2008). The second mechanism is a dynamic thinning of the terminus zone of the marine terminating outlet glacier reducing the effective bed pressure, allowing acceleration – the Jakobshavn effect. The reduced resistive force at the calving front due to the thinner ice, now experiencing greater flotation, is then propagated “up glacier” (Hughes, 1986; Thomas, 2003 and 2004). 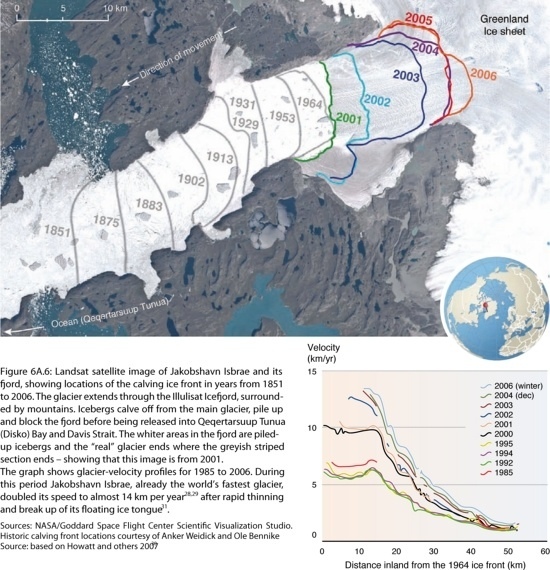 If the Jakobshavn effect is the key the velocity increase will propagate up-glacier, there will be no seasonal cycle, and thinning and acceleration would be greatest near the terminus. Petermann Glacier is a much different glacier than the others mentioned above. Its velocity of 2-3 m/day (Higgins, 1990) is much lower than 10-30 m/day observed on the other marine terminating outlet glaciers. It is located on the northwest corner of Greenland and certainly experiences less melting and less snowfall. The lower 80 km (in length) and 1300 km2 (in area) of the glacier is afloat. This makes it (by area) the largest floating glacier in the Northern Hemisphere. The ice front is not impressive,unlike the faster outlet glaciers. The calving front protrudes a mere 5-10 m above sea level, reflecting the fact that the ice at the front is only 60-70 m thick. Further up-glacier, the ice at the grounding line is 600-700 m thick. The combination of velocity and thickness yield the volume of material calved each year. Petermann Glacier calves 0.6 km3 (Higgins, 1990), whereas Jakobshavns yields close to 40 km3. The thinning between the grounding line and the calving front is mainly via melting as the snowline is at 900 m. The low slope leads to very low velocities, giving the low-lying floating section plenty of time to melt, and surface melt ponds are common. The Petermann Glacier lost a substantial area, 29 km2 due to calving this summer (Box 2008c), and a crack well back of the calving front indicates another 150 km2 is in danger. The volume of the ice lost is much less than that from the loss of a comparable area by Jakobshavn because the ice is an order of magnitude thinner. Once again the key to this glacier’s second major ice loss this decade after limited retreat in the last century, is thinning of the floating tongue, which weakens the glacier. The loss of this ice should then lead to acceleration, developing more crevassing and glacier retreat. The crack seen in the image of Petermann Glacier (ASTER image provided by Ian Howat of Ohio State) is more of a rift, like those on Larsen Ice Shelf, than a crevasse. This transverse rift is further connected to longitudinal-marginal rifts. Illustrating the poor connection of the Petermann Glacier to its margin and lack of a stabilizing force this margin has, even 15 km behind the calving front. This is not the only rift of its kind on the glacier. Also note that like on Larsen Ice Shelf the rift crosscuts surface streams. A series of Landsat images from 2002, 2006 and 2007 illustrate the shift in the terminus and in the position of key rifts A, B and C. The distance back from the terminus has diminished for A and B from 2002 to 2007. In 2006 to 2007 the shift in the position of C is also evident. … ratio of retreat to the along-flow stress-coupling length is proportional to the relative increase in speed, consistent with typical ice flow and sliding laws. This affirms that speedup results from loss of resistive stress at the front during retreat, which leads to along-flow stress transfer. Many retreats began with an increase in thinning rates near the front in the summer of 2003, a year of record high coastal-air and sea-surface temperatures. This indicates again the importance of pre-conditioned thinning via melting. Wilkins Ice Shelf (WIS) refused to hibernate this winter. A previous post noted that the recent collapse of Wordie Ice Shelf, Mueller Ice Shelf, Jones Ice Shelf, Larsen-A and Larsen-B Ice Shelf on the Antarctic Peninsula has made us aware of how dynamic ice shelf systems are. The reasons for Ice Shelf collapse continue to be identified, but one key thread emerges. The decade prior to collapse the Larsen-B Ice Shelf had thinned primarily by melting of the ice shelf bottom (by the ocean) by 18 m (Shepard and others, 2003). Thinning preconditions the ice shelf for failure by weakening its connection to pinning points at the grounding line as the shelf becomes more buoyant. Glasser and Scambos (2008) observed that prior to collapse that rifts and crevasses parallel to the ice front crosscut the meltwater channels and ponds, hence, post dated them. The number and length of the rifts increased markedly in the year before collapse. There was no evidence of relict rifts, illustrating that these rifts are a feature of the last 20 years. After ice shelf collapse the ice front receded to the pre-existing rifts, and the pre-existing rifts defined the area of collapse. In this case the thinning and resultant structural weaknesses preconditioned the ice to rapid breakup, which proceeded to lose only the preconditioned portion of the ice shelf. The WIS is buttressed by Alexander, Latady, Charcot and Rothschild islands and by numerous small ice rises, indicating that they are touching the ocean floor. WIS was examined by Braun, Humbert and Moll (2008). They found that drainage of melt ponds into crevasses were of no relevance for the break-up at WIS. On WIS the evolution of failure zones is associated with ice rises. In 1993/94, rift formation started to expand at the northern ice front. Today, the central part of WIS is intersected by long rifts formed in and around ice rises. The rifts up to tens of kilometers long evolve and coalesce prior to break-up events. The conclusion for WIS is that preconditioning of the ice shelf by connection of the rifts in the failure zones near ice rises trigger break-up events. The thinning and rifting lead to a cascade of failure. The Feb.-April break-up left a narrow 6 km wide fractured connection to Charcot Island. Existing rifts formed between already existing fractures, crossed almost the entire northern shelf. This fragile and vulnerable area was expected to collapse further the next austral summer. However, it instead has happened this austral winter with loss of an additional 160 km2 of ice. It is the first winter ice loss of an ice shelf ever observed, and so was surprising. However, looking at the image below, from the European Space Agency showing the extent of the rifts as winter began, makes this less surprising. The question is more what can possibly hold this together? The area of interconnected rifts seen is 2000 km2. If this is lost an additional 3000 km2 of the 13 000km2 of WIS, is at risk when this connection to Charcot Island is lost (Braun, Humbert and Moll, 2008). It appears then that glacier or ice shelf thinning is the key preconditioning factor for collapse, retreat and acceleration, whether you are in Antarctica of Greenland. The mechanisms for ice shelf thinning include basal melting (from warming ocean waters), surface melting, reduction in glacier inflow and rift development. These are interrelated mechanisms that precondition the ice shelves to collapse. On marine terminating outlet glaciers the mechanisms to trigger thinning is surface ablation causing thinning, and potentially basal melting, though not yet observed (though see this recent paper by Holland et al, 2008). Once the process begins thinner less buttressed ice enables acceleration and more calving and more retreat. There is a potential difference between the two, in glacier such as most marine terminating outlet glaciers, where the glacier flow is rapid, acceleration results from retreat and thinning. In the case of ice shelves a glacier buttressed by them will accelerate after the loss, but the slow moving ice shelf may suffer from reduced inflow. Attention will continue to be focused on these rapid responders to climate change;marine terminating glaciers in Greenland and ice shelves in Antarctica. We can look forward to more details from the extensive 2008 summer field season in Greenland and the upcoming view of the Wilkins this fall. Higgins, A. 1990. Northern Greenland glacier velocities and calf ice production. Polar Forschung, 60, 1-23. Howat, I., I. Joughin, M. Fahnestock, B. Smith,T. Scambos 2008. Synchronous retreat and acceleration of southeast Greenland outlet glaciers 2000–06: ice dynamics and coupling to climate.Journal of Glaciology, 54(187). Hughes, T. (1986), The Jakobshavn effect. Geophysical Research Letters, 13, 46-48. Thomas, R. H. Abdalati W, Frederick E, Krabill WB, Manizade S, Steffen K, (2003) Investigation of surface melting and dynamic thinning on Jakobshavn Isbrae, Greenland. Journal of Glaciology 49, 231-239. Thomas RH (2004), Force-perturbation analysis of recent thinning and acceleration of Jakobshavn Isbrae, Greenland, Journal of Glaciology 50 (168): 57-66. Thanks for this update on a rapidly evolving field of study. The linking of structural integrity (or its lack) and melt rates seems logical, though it is a connection that doesn’t always seem well understood by commentators here and elsewhere. It is also interesting how little fanfare the Wilkins collapse received. My two cents: humidity and wind can be important in melting snow and ice. In the “North Pole Notes continued” thread Wayne Davidson wrote #450 Terry, Full moon effects are always fascinating to watch. The subsequent posts have been quite interesting (although I say it myself) and the conclusions may be relevant to the calving of glaciers. Why is the floating ice getting thinner? It is being warmed from above and below if I read it right. It seems like it doesn’t take much to make a big change. Cracks grow and connect to each other, creating very long cracks rather than freeze back together as they did when the temperature was slightly cooler. This hints that we are at or near a tipping point. The ice must now be at a temperature that allows the ice to change shape much more easily than it did before. It seems like that indicates that the temperature is close to the melting point, at least for ice under the pressure found inside the glacier. Am I right? Since melting point varies with pressure, can you make a theory that relates the thickness of the ice to the temperature? As the ice warms very slightly, it may be required to get a lot thinner. The end point is that at the melting point at zero pressure, the thickness of the ice has to go to zero. Regarding 5 and 6 I am not making a case that the ice is weaker. I do not believe that the temperature change for the ice shelves has resulted in this. It is the thinning that weakens the ice shelf, leading to greater floatation and reduced contact with pinning points and consequent rift development and expansion. The thinning can come from bottom melting or surface melting or a combination for the ice shelves. The Greenland Ice Sheet ice properties are not changing, it is the balance of forces that is changing due to thinning. In this case we have no data to conclude that basal melting has changed and only small areas are actually afloat and exposed to the potential for additional melting via sea water. One thing that is common to sea glaciers and ice shelves is that they are both affected by sea level rise. This will produce a vertical torque, especially at times of high tides (see my #3), resulting in increased calving. As you are aware sea level rise also has the effect of moving the grounding line proximally, which reduces the friction on the ice shelf or valley glacier without reducing the gravitational force which is driving the ice from the slopes beyond the coastal plain. The acceleration is part of a positive feedback loop so its effect will increase with time. Is sea level rise only now emerging as a significant player? A public-access copy of the Holland et al paper is here. As ice warms, it gets weaker and will deform under its own weight. See for example http://skua.gps.caltech.edu/hermann/ice.htm. However we have all seen movies of great chunks of ice suddenly breaking off to crash into sea to form iceburgs. Iceburg calving is an example of brittle failure of ice. Brittle failure of ice apprears to have been studied as a result of increasing strain,with less attention paid to brittle failure of ice as a result of increasing temperature that change the strength of the ice. Alistair (#7) mentions sea level rise. Has anyone put the pieces together yet and considered how these improvements in understanding ice shelf break-up translate to predicting sea level rise? Presumably the loss of ice shelves increases the discharge rate of land-based ice but can we learn anything from this as relates for example to the prospects of the West Antarctic Ice Sheet (WAIS), a substantial fraction of which is grounded below sea level? Lose the trailing slash in Steve’s link above, and it will work. Even temperate ice is quite strong and can sustain massive calving fronts. We have many temperate glaciers that rival the size of the terminus reach of many Greenland glaciers and the ice is somewhat but not greatly weaker. There are many in Palin’s home state for example. The Holland paper raises an interesting point. Is it warm ocean water impacting the Jakobshavn. The analysis in this Realclimate review points out it can be surface melting or basal melting that can induce thinning or both. It depends on the specific situation. The Holland paper hints for the first time that ocean temps may have a role. I would caution the reader that no temp observations right near the calving front are available to document this to be the case. The measurements are some distance from the calving front and may not have resulted in warming under the floating section. There is certainly a strong freshwater flow exiting from beneath the glacier to consider. Secondly as Howat et al., (2008) Sole et al., 2008 have noted the acceleration and thinning is occurring on over 40 outlet glaciers, many of which are not afloat at all and thus basal melting from warmer seawater cannot be the explanation. I am intrigued by the Holland paper and the concept deserves further examination, but it long way from being based on conclusive observational evidence that it is the cause of Jakobshavn Isbrae thinning. More humid air weakens ice. Humidity (dewpoints) have been increasing at climate stations in the Upper Midwest and Alaska. Could you please help us laypeople understand how humidity weakens ice? I’ve never heard that before and I’m puzzled at the mechanism. Is it the heat released by condensation of the water vapor? Perhaps a bit off-topic– Getting away from the ice sheet surface (and below it), I’m curious as to what kind of effects the presence of atmospheric aerosols have in the polar winter. Presumably they have little to no shortwave albedo effect, but how significant is the downwelling infrared term (it’s very dry) at either ice sheet during the dark months? river ice black in spring. “If water from moist air condenses on a snowpack, 590 calories of heat are released by each gram of condensate. This is enough energy to melt approximately 7.5 gm of ice, which when added to the condensate yields a total of 8.5 gm of potential runoff”. Is there any trend in the iceberg data? If there were truly an increase in glacier calving events (due to warming or any other cause), the best evidence would be an increase in iceberg numbers starting in 1900 for example. The following site shows downwelling IR currently in the arctic it hasn’t dropped much since the summer high. The subsurface has warmed, but why? Holland says it is due to a change in the atmospheric circulation resulting in a change in the North Atlantic gyre which then has allowed warmer water into the South Greenland region. That can increase the sea surface temperature and the air temperature, leading to more rapid melting and thinning at the glacier terminus. This effect would be countered to some degree by the cold freshwater melt coming off the glacier into the ocean, probably felt most strongly at the end of the melt season. Thus, the mechanisms (terminus thinning and subsurface warming) don’t seem to rule each other out, and both might be adding to the overall observed result. We do know that ocean basins produce this oscillatory behavior – the El Nino / Southern Oscillation, the Arctic Oscillation, the Pacific Decadal Oscialltion, the NAO, the Madden-Julian Oscillation (Indian Ocean), but they seem to have a bit of a random component, their forcing mechanisms are poorly understood, their “phase changes” appear impossible to predict very far in advance, and they must also be sensitive to the overall climate warming. What is most irksome is how these oscillations, which are real phenomena, have been abused by the tobacco science skeptic industry as an “explanation” of why the climate is warming. This leads to bias on the part of the observer, however… The real issue is probably the inverse – how is the warming climate going to alter / interact with these oscillations? What will happen to NAO, El Nino, etc., in a warmer world? That’s a big unknown. Thus, while it may be possible to attribute the warming subsurface to a change in the NA gyre circulation to a shift in the NAO, to what do we attribute the shift in the NAO? We might be seeing an increased equator-to-pole heat transport effect as well. Unfortunately, there is no detailed instrument record of subsurface changes in Gulf Stream heat transport into the region over the past decades, so it’s hard to say – and the atmospheric component? Here is a paper in press which discuss the seismic effects to calving events in Greenland. The authors propose that glacial earthquakes are caused by icebergs overturning and scraping the fjord bottom during calving. What kind of implications could this have for seismic activity with further melting on the edges? Surely, this area of incredible research represents nothing more than reporting on regions of the planet where little analysis had been done previously. We now have the technology to view and document natural variability, big deal. Since there was modest research and zero satellite images dating back to the beginning of this century (for obvious reasons), we lack sufficient time scale with glaciers in the Arctic and the Antarctic. Does it really matter what glaciers have done or not done over the past 10-years? The media constantly remind us how unprecedented these events are. But without any trustworthy historical data, it is meaningless. It is curious that virtually no evidence on the thousand of glaciers that are advancing around the planet go unreported. It seems to me, observing a handful of cherry picked glaciers that are breaking up, as hard evidence to buttress global warning, is intellectually dishonest, despite the research acumen in a relatively new field. Mauri, what you said to me in #21 was about what Mark Serreze said to me in Boulder last May. Serreze also showed me his work in Arctic sea ice monitoring and research at NSIDC. I think NSDIC did a good job this year in keeping people informed about the shrinking sea ice trend. It’s even more curious that Ian is saved by his own double-negative. Intentional? As Dr Hansen points out in that article, ice sheet melting is non-linear but the scientists want to draw straight lines and ignore any tipping points. Hansen calls this “reticence”! But there seems little point me pointing out the foolishnes of the scientific world. Hansen has tried to avail. What chance have I to warn of the dangers ahead. The causes of this financial crisis were known long ago but no one could stop that. What chance is there of preventing a worse global catastrophe when abrupt climate change hits? We must be the two worst students in class. I agree with you, that moist air can rapidly melt big ice. I think that any ice subject to the formation of moulins cannot be considered, “isolated from the atmosphere.” Water falling down the moulins releases heat, and that heat softens the surrounding ice. Heat is being advected into the bulk of that ice, so the bulk of the ice is not sealed off. That is basic physics that I learned in grade school, and I cling to it. True, the vast bulk of the GIS is still too high, too dry, and too cold to have surface water and form moulins. In that desert, the surface ice sublimates, leaving colder, harder, stronger ice behind. However, that high dry cold ice depends on the mechanical support of ice at lower altitudes. Ice that has moulins in it is weak. The speed that moulins close at the end of the melt season shows how soft and plastic that ice becomes. Anything that depends on such ice for mechanical support is in trouble. This is not our grandfather’s Greenland. Places where he had sea ice, we have have open water. He had an Arctic desert; now it rains at the North Pole. Models built for a cold desert, may not work in a new Greenland where the dew point may exceed 0C. But wouldn’t the ice sheet give up an equivalent amount of heat when that water evaporates as it gains when it recondenses? Seems like a net-zero. It is not adaptive to despair. Richard that is a good point, but the energy is coming from the sun. By increasing the humidity, the solar energy is used more efficiently, or putting it another way there is less energy lost to space by the emission of longwave radiation because humid air has a strong greenhouse effect. The Jakobshavn effect is the same as the “champagne cork effect” I understand. Will this analysis and the referenced evidence (+ results of the 2008 summer field season in Greenland) be presented to world leaders at the UN Climate Change Conference in Copenhagen next year? I obviously cannot use logic to convince that slightly warmer ice exposed to a bit more humidity will not weaken the ice notably. But lets review a few details. The number of lakes on the surface of the GIS is not significantly greater than in the 1950’s imagery or the 1980’s imagery. They must have a greater volume and flushing rate with higher melt of course, but they are not new. The moulins have always been there as well. Of course they also have a bit more volume now and maybe a bit higher distribution. But in general the area of lakes and moulins has been a zone of melting, thus we are not talking about a change in surface state. Also you need to look at, walk across glaciers in temperate climates with high melt rates, and far more moulins per unit area to realize that these features do not significantly weaken the ice, anymore than pulling a hair from your leg weakens your leg. That is how small moulins are compared to the entire ice sheet. They do carry lots of water and that is a different point. The theory is sound with holes and humidity, it just is not realistic as a big picture player. I have made plenty of observations of melt rate on the walls of moulins and it is similar to the surface rate, but is not very large. It seems logical that daily melt rates tend to increase when hours of daylight per day increase, and when surface dewpoints exceed 0 deg C melting can occur all hours in a day, even the darker hours. Oh well, the idea of it all being caused by rising sea levels does not seem to grab you, and my (and Jim Hansen’s) wet surface seems to have an energy balance problem. So how about this? As CO2 concentration increase so will its greenhouse effect which will raise the height of the snow line globally. Since the snow line falls with latitude, raising the snow line will tend to melt the ice sheets from the lower latitudes first, for example the Antarctic Peninsula and southern Greenland. Raising the snow line will also begin by removing the equitorial ice caps (Kilimanjaroo) and the sea ice, which is what we are seeing. It will also leave the tops of the high ice sheets, such as Greenland and East Antactica, unaltered as you are reporting. Since the firn line line and the snowline are related, it should be possible to check whether the firn line has risen by the same amount for Jakobshavn Isbrae, Wilkins Ice Shelf and the Petermann Glacier. If so, then I would think that anthropogenic greenhouse gases may be the main culprit. As sea level rise is on the order of a few mm/annum, and rapid glacial melting tends to be more like a meter/annum, SLR should be seen to be a much smaller effect. There could be two impacts, from an increase in air temperature and/or atmospheric humidity. The most obvious one is heat transfer to the snow/ice surface. Less obviously and indirectly, the change in surface properties due to melting likely decreases the albedo. Could this second effect be important, and possibly underappreciated? I think Hansen referred to it as albedo flip? Ian, where in heavens name did you get the idea that there are 1000’s of advancing glaciers !!?? Just curious. Consider a glacier sized piece of ice. It has flow properties that can be estimated from equations such as those at http://skua.gps.caltech.edu/hermann/ice.htm. However, the core of the glacier is an incompressible fluid (ice) with limited thermal conductivity. In the winter the skin of the glacier loses heat and becomes stronger. Now you have a fluid inside of a stronger skin which is a turgid structure. Turgid structures are stronger than would be estimated by the bulk properties of the internal fluid or the mechanical strength of the skin alone. Examples of turgid structures abound in biology and have been used in engineering such things as liquid fueled rocket boosters. In the melt season, the skin of the glacier warms, softens, and the entire structure of the glacier loses strength. The entire structure loses mechanical strength despite the fact that only a tiny volume of ice on the surface changes temperature and thus its mechanical properties. This loss of strength allows the glacier to flow more rapidly or to surge despite relatively small heat fluxes over a brief period. Turgid structures are the ultimate in non-linear behavior. If you consider a glacier in the winter as a fluid in a stronger skin, and consider the same glacier in the summer as a weaker surface around core that is now colder than the surface you will have a physical explanation for why glaciers surge in the summer. Of course, basal lubrication has an effect, but mostly, surging is caused by gravity on a mechanical structure that rapidly loses strength as the skin softens. You are going to say, “Oh that is impossible and silly.” How thick is the skin of a the guard cells that control the area of stomata? Glaciers change the strength of the skin rather than the contained volume, but the mechanical effect on the strength of the structure is the same How thick is the skin of a rocket booster held rigid by pressure of the fuel inside? How thick is the skin of a child’s balloon after the clown has tied it up into an animal shape? In Sole et al 2008 above it said that only 18% of the GIS is grounded below sea level, and that only 2-5% of it is subject to potential ocean contact. Is this data accurate and conclusive? Most everything I’ve seen on the net says that most of the GIS is marine and subject to ocean contact. A critical answer when it comes to predicting the fate of the GIS. You mentioned reduced glacier inflow as a reason for ice shelf thinning. Is this because thinning results in reduction of cross sectional area of the inflow channels which offsets any gain due to increase in inflow velocity ? I would like to make two points of order here. Moderator may wish to delete them as they are not germane to this article. 2)I had to reload the comment page three times to arrive at a captcha legible to my failing vision. sidd (41) — The top of the three buttons just to the left of the reCAPTCHA logo gives you a new pair of words to try; repeatedly. #18. Phil, Downwelling IR is very interesting to have on a live basis as per link, what would be even more interesting is to have a similar sensor on the Polar ice cap during a known cooler period, say 1996-97 pre monster El-Nino period. IR Downwelling really seems to describe the heat of the entire lower atmosphere better than other traditional and none traditional methods. “The North Pole” graph, captures the missing data needed to explain some anomalies related to Polar ice cap and Polar glaciers melting. The peak IR of the melt season occurred mid-September as opposed to warmer surface temperature months, which is right, its the moment when the lower atmosphere is at its warmest. There are still significant warm spells in the High Arctic lately, last week over Cornwallis +4.8 C was measured along with freezing rain on the ground at -2 C, a plane flying over Lancaster Sound measured +10 C.. All the while ground temperatures were moderately above normal. Meaning, surface temperatures do not represent total heat of the entire atmosphere well, in this case the heat was really above, this drives surface temperature sensitivity quite wild over a longer time period. We are dealing with a vertically roving heat zone which appears and moves in mysterious ways, ultimately disabling our ability to discern any stable surface temperature trend in the short term. Do the infrared astronomers keep track of this? I know some limited infrared astronomy is still done from Earth’s surface despite the infrared “sky glow” but I’d guess they must measure the infrared brightness of the night sky regularly, as a visible-light astronomer worries about sky glow in his or her observing frequencies. Astronomers use wavelengths where there are ‘windows’ of no absorption so I don’t know if they are that worried about monitoring since they look where it isn’t. See below for details. This “downwelling IR” is very interesting. I hope you guys continue your discussion of it. I wonder if there are any “standard candle” infrared sources on the ground that are picked up by the infrared weather satellite imagery — they’d have to be something large to fill a pixel, maybe there’s a cooling pond for a reactor that has its temperature regularly documented? — if so, looking at the brightness of that known source viewed from above and compared might also be useful. Or, of course, there must be much higher resolution infrared imaging systems in orbit. Perhaps we need a new ‘Gore Box’ initiative to open up military records for the atmosphere, the way then VP Gore did for the navy’s Arctic Ocean records — if someone can specify in a wishful-thinking way what would be relevant and useful, perhaps it’s there for the asking. Pure speculation — but odds are there is data that can be pulled out and reused. Calling for a data mining expert in astronomy …..
I’ve two starking ocean current hypothesees to offer the climatific community. 1) It appears AGW that melts arctic freshwater also results in a negative feedback that acts against runaway warming; more warm Gulf Stream volume eventually results in less cool volume from Antarctic subpolar current to North equatorial at the base of Cuba. This is all from a googled 2007 news article. You’d expect more warm current to “churn” more cool current, but it actually churns more cold water to move around Antarctica in circles rather than head north. My insight is to suggest a mini-version of this historic effect (8200 yrs ago) might occur as arctic ice/glaciers melt, inducing a hiccup of lower temps in Eastern N.America and Western Europe. Were this to be predictable, farmers could maybe adapt by having cooler crop varieties handy. 2) Looking at a map of ocean currents in the Southern Hemisphere, the catastrophic worst case scenario in the warm direction (as bad as an Ice Age), one that would end our civilization, might occur if the Antarctic Subpolar current circling Antarctica breaks down and heads north. Right now parts of it branch off to form various cold currents: Peru, Benguela, W.Australia. More accurate to say if we AGW enough to cause a warm current; Brazil, Mozambique, E.Australia, to reach Antarctica rather than hitting the Antarctic Circumpolar and turning north…if the warm hits glaciers and the subpolar current turns north somewhere instead of circling Antarctica: this event if possible should be used by scientists as the worst-case baseline where our species becomes about as valuable as any other species when making normative economic calculations.